Meningioma – The Surgery | Cheer Up! Posted on November 19, 2015	by Mimi G.
“Julio, Julio, Julio!” The voice penetrated my morphine-induced haze all night long, as if in a nightmare. It turns out that the post-surgical intensive care unit of a neurosurgery ward is not a quiet place. Eighteen hours previously, I had checked into the hospital, and they started me off with a brand-new MRI. This would be the roadmap, as my surgeon used the bright green sensors now stuck on my forehead to navigate inside my brain. 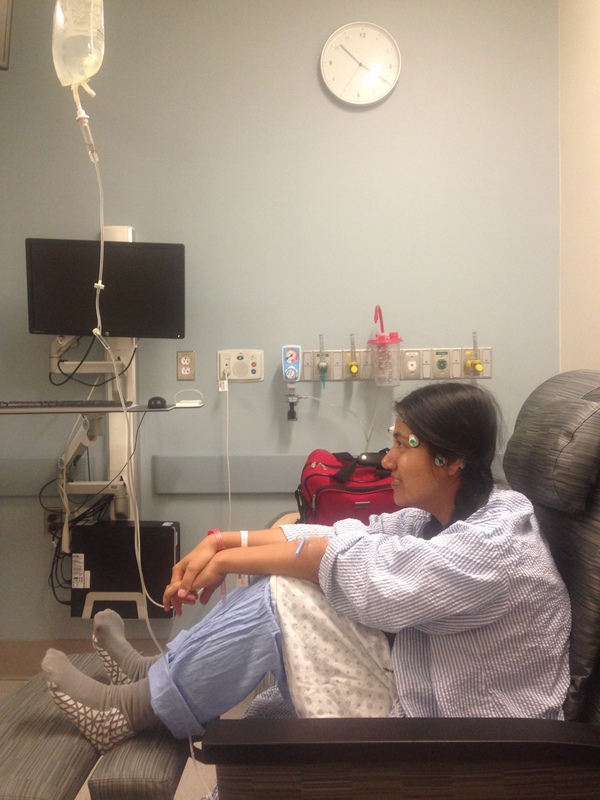 In brain surgery, everything really hinges on the skill of your surgeon, and I was confident. It was time to say goodbye to Betsy. The first surgeon I had consulted was as regal as a lion. Sitting in his opulent office, he informed me calmly that he intended to take out a quarter of my skull, peel back my face, and lift up my frontal lobe in order to get to the tumor below. He did not have time for questions. Something told me to seek a second opinion. The surgeon I finally picked, Dr. T, is a neurosurgical celebrity. You could see it in the worshipful attitudes of the students that trailed him everywhere. He pioneered some of the minimally invasive techniques for brain surgery back in the early 2000’s. He combined a youthful energy with a confident professionalism as he explained why he would go in through my right eyebrow to get at the tumor, and waited patiently for my questions. He was just as down-to-earth that morning. Dr. T (smiling): Are you ready? Nervous? Myself: Well, all I have to do is just lie there. The real question is, are you nervous? Dr. T (seriously): Not at all. I’m confident. He had told me that in any brain surgery, there is a 2% chance of serious complications. A stroke. A hemorrhage. My surgery took five hours, hours during which I was blessedly unconscious. I sometimes wonder how my loved ones spent those hours in the waiting room. Did my dear friend pour herself one cup of coffee after another, letting them grow cold untasted? Did my husband curse and slam his fist against the vending machine when it swallowed his dollar, not spitting out a candy bar in exchange? Did my mother clasp her hands together so that the knuckles turned white, praying to a god I did not believe in? Did they all look up hopefully or fearfully every time a footstep sounded outside? 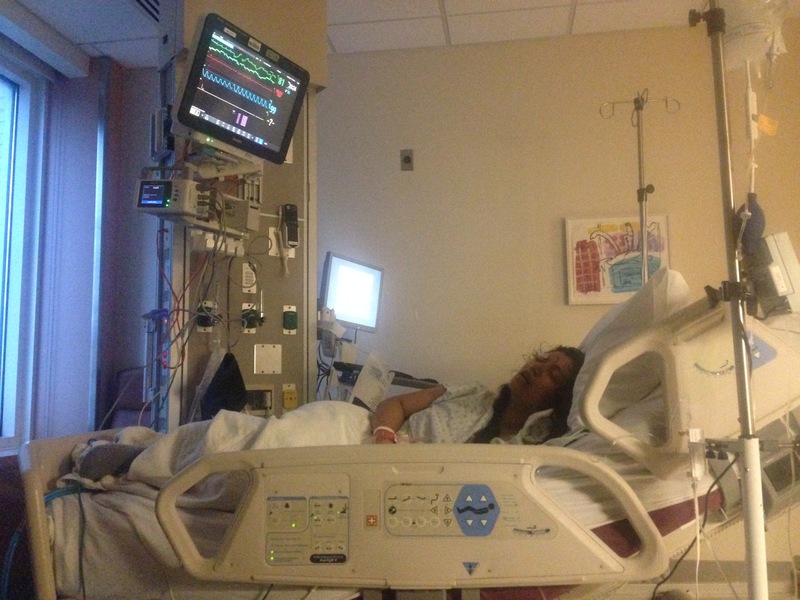 I spent one night in the ICU, and two in the recovery room, before being moved to a regular room. I was in a lot of pain — more pain than the morphine could tamp down — but there is something freeing about knowing that going to the bathroom on your own is the highest bar to which you’ll be held. There is nothing like a neuro ward to make you grateful for your own blessings, and horribly sorry for those who are not as fortunate. There was Julio, who could not respond to the doctors’ persistent calls. Kim, who looked almost like a child, whom the physical therapist was coaxing to take a step or two on her own, while her painfully young husband stood helplessly by. Monica, who was in pre-surgical emergency, and lay alone in bed all day, muffling her moans, making a single phone call to tell her father that she was okay and he need not come. I was spoilt. My husband was by my side all day, and my sister, who had flown 24 hours just to be by my side for the surgery, was there all night. They held my hand, helped me sit up, persuaded me to try one spoonful of food. (Note on hospital food: Why are there 5 pages of menu? Which sick person can swallow and keep down enough to want all those choices?) My lovely nurse, Sarah, the one who prided herself on getting in an IV in one painless stick (something I badly needed — I ended up with about eight of them), told me how lucky I was. Most of the time, she said, the nurses ended up acting like family to the patients, reassuring them that everything was going to be okay. Yes, I was lucky. Five days after the surgery, I went home. There were going to be some excruciating weeks, and exhausting months ahead, but I was not alone. I was loved, and I knew it. This entry was posted in Life, Mental Health and tagged Brain Tumor. Bookmark the permalink. What I admire most is the attitude of counting one’s blessings. Meals were strictly for patients — the menu might have made sense if family was included!